Guess what?! You don’t HAVE TO BUY maternity tops. During this last pregnancy, I tried something new. I ONLY bought a few actual maternity items. You can see the specific list here of what I think is important! For everything else, like tops - all I did was size up! 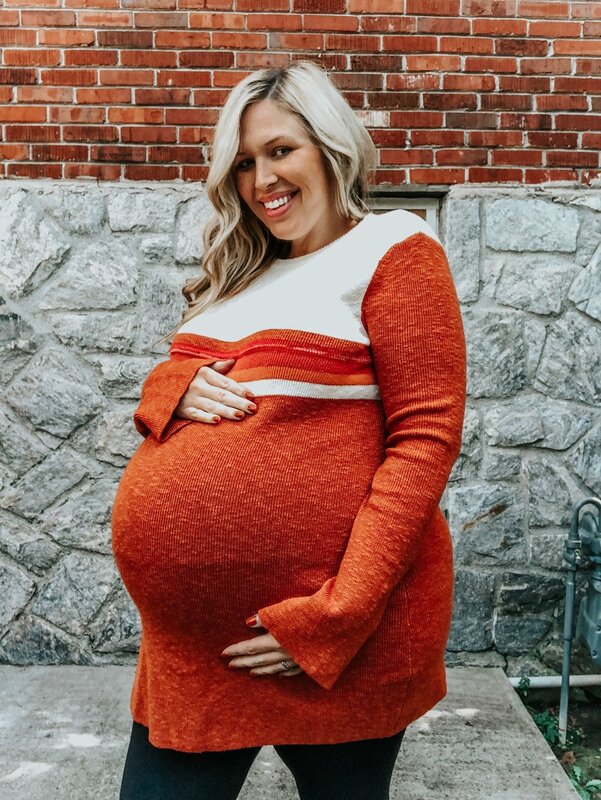 I did this because in theory, I knew I wasn’t going to want anything tight fitting once I was postpartum anyway… so having an oversized sweater to wear that is cute would actually work out perfectly. If you scroll my Instagram or look through my blog, most of my tops and dresses all non-maternity. But I decided to compile them all for you here! fyi - i was a size 16 before getting pregnant. Most brands these days are carrying styles that work for the bump - looser around the stomach, longer tunics, etc. *THIS WORKS BOTH WAYS AS WELL - only buy maternity tops that you can see yourself wearing postpartum. PinkBlush makes a LOT of styles that work well for this. I wear my PinkBlush tops all the time, esp this one! This top I’m wearing here is actually a Free People sweater dress. But it looks like a fitted tunic top with the bump, right?! And without the bump it’s just loose and cozy. I personally love the bell sleeves too! Here are some tops available that you might want to try! Good for non-pregnant, pregnant, or postpartum. A LOT OF THE MACY’S ITEMS ARE ON MEGA MEGA SALE RIGHT NOW. Get it girl.